Feel the energy at ESPANA. 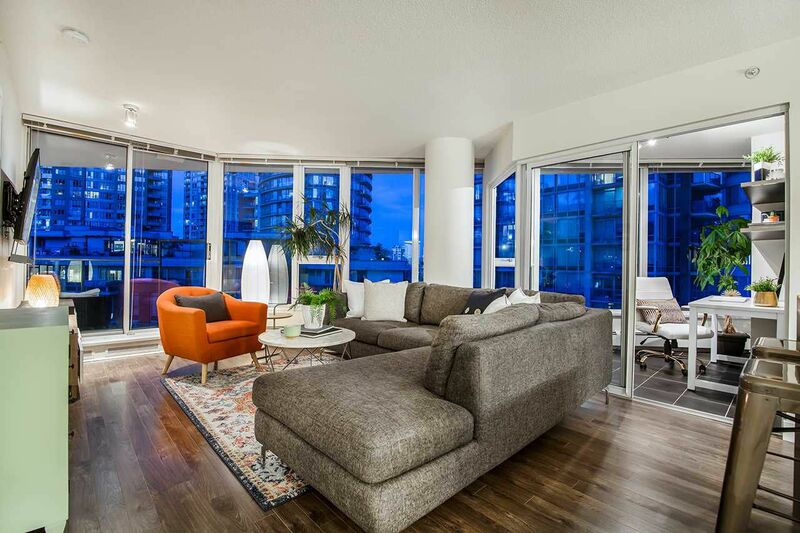 This immaculate 947sf 2BR+Den, 2 Bath NE-facing corner unit is surrounded by windows & boasts a pleasant outlook w/surprising views of the N.Shore mountains & Science World. Great layout w/separated bdrms, spacious dining/living areas, open kitch w/granite counters, stainless appl's & wine cooler, bright solarium, sleek euro-style bathrooms (w/enourmous soaker-tub in master) & spacious covered patio. 1 Pkg, lrg in-suite storage + separate locker. Sporting events, concerts, shopping & 1st class restaurants right at your doorstep...feel the energy on game day...and sit back & watch as this neighbourhood continues to blossom w/new parks & positive development. ESPANA boasts fabulous amenities & is Pet/Rental friendly. OPEN SUN APR 7, 12:00-1:30pm.